When Mel Gibson decided to make a film about Christ and the last hours of his life he wanted to create an authentic and powerful film. He started to search for an appropriate location and chose the remote and barren landscape of Basilicata, Southern Italy. Here in the in-step of Italy between the toe and the heel is the beautiful stone-built city of Matera. According to UNESCO this is the most outstanding example of troglodyte (cave) settlements in the Mediterranean region. No wonder Mr Gibson decided on Matera as a suitable representation of Jerusalem. Matera is a magnificent settlement surrounded by the arid hills of Basilicata. This region is the most remote and the poorest in Italy. The people used to live in ‘sassi’ literally caves carved out of the limestone rock of the hillsides. The caves kept the occupants warm in winter and cool in summer. In the 1920s and 30s Mussolini exiled his political opponents to this isolated corner of Italy. Carlo Levi a famous doctor, artist, writer and political activist from Torino was exiled here in 1935-6 and wrote the famous ‘Christ stopped at Eboli’ as a result of his experiences. In those days grinding poverty and malaria were the local people’s main concerns. Anyone who could leave the area left. This selective migration away from these rural towns and villages created an ‘inertia’ amongst those remaining that was almost completely paralysing in its effect. By the 1950s and early 1960s the remaining ‘campesinos’ were ordered to leave their cave dwellings which they frequently shared with the family livestock and ordered to move into modern houses built outside the old town. The ‘sassi’ were abandoned and lay deserted and gradually fell into ruin. Walls collapsed, roof tiles fell to the ground, gutters hung at jaunty angles as they surreptitiously moved away from their brackets. The ‘old town’ was sad, empty, without a purpose. Then in the 1980s and 90s something magical happened. EU money arrived in Southern Italy big time. All of a sudden there was money available to invest in new roads, utilities and modernising the ancient ‘sassi’ homes. Cheap flights in Europe meant that tourists could visit Basilicata and neighbouring Puglia more easily. Things were looking up. 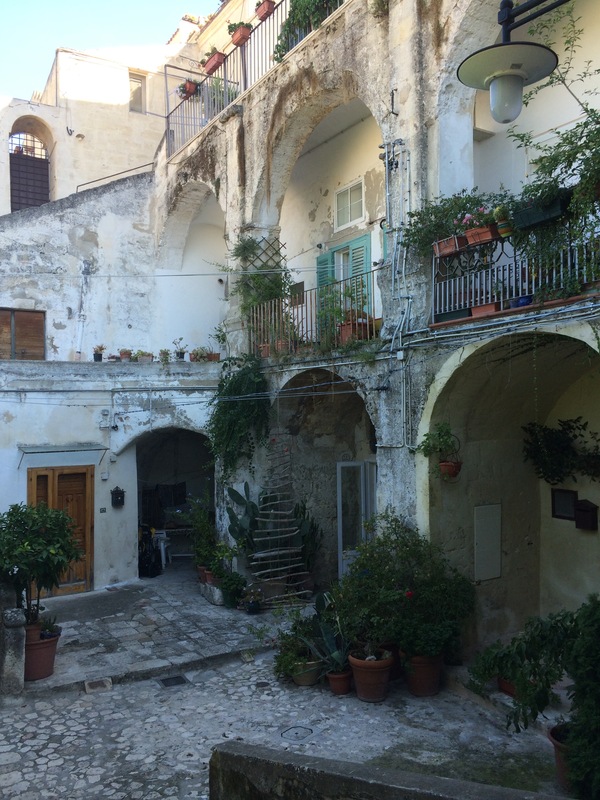 UNESCO designated the ‘sassi’ of Matera as a World Heritage Site. This brought publicity, promotion and further investment. The Italians are hard-working and quick to spot an opportunity to make money. One rainy evening I stepped out of my ‘sassi’ hotel in the pouring rain to be greeted by a local boy with a tuk tuk. I actually did a double-take, I’d never seen a tuk tuk in rural Italy before. For €15– he took me and a small group of friends to a restaurant on the other side of town. It was the best fun careering along the narrow stone paths of Matera in a charming little tuk-tuk. When we arrived at the ‘Soul Kitchen Ristorante’ we were in for such a treat. The restaurant is run by two brothers, Pietro and Mimmo. One brother is the chef, the other is the charming host. These guys were fantastic. Funny, welcoming and completely delightful. The restaurant is part of a series of ‘sassi’ built into the hillside. 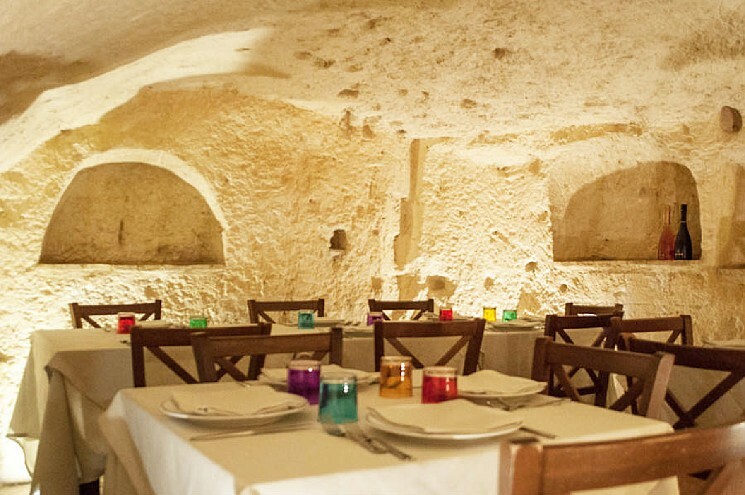 Our table was upstairs in the arched roof-space that had been carved out of the rock hundreds of years earlier. Delicious pasta, home-made that morning, fish and meat dishes, fabulous local wines – this was a complete treat. The brothers set up the restaurant just two years ago, their ethos is ‘cuciniamo bene perche ci piace mangiare bene’ ‘we cook well because we like to eat well’ or perhaps more apposite ‘une grande passione per il loro lavoro’ with ‘a great passion for their work’. By the time we left the restaurant many hours later we felt we were leaving a private home. Even the bill was modest – after all this is Basilicata. The next morning the sky was blue and the sun shone brightly. The golden stones of the city glistened in the early morning light. Our guide introduced us enthusiastically to her city. She asked if we had heard of Mel Gibson and his decision to make ‘The Passion’ here in Matera. On the eastern side of town there is a gorge, known as La Gravina. Then on the far side of the gorge there is a cliff-like area of high ground used by Mr Gibson as the setting for Calvary. The location is barren, bleak and exposed. We wander along the polished stone pathways of the town. We visit a ‘sasso’ a typical cave dwelling showing how life would have been for the local people. A cave with a dry earth floor, cooking area, stall for the donkey, a bed (sometimes elevated) at the rear of the cave. Simple, compact and providing everything that the local family needed and nothing more. Next door is a church hewn from the rock. it now houses a sculpture of The Last Supper made entirely from twisted metal. The metal came from fragments of the World Trade Centre destroyed in the 9-11 attacks in New York in 2001. There’s also a scale model of Matera located in yet another ‘sasso’ just as you come into town. I nearly didn’t go in to see the ‘model town’ because I rather arrogantly had decided it was just a tourist trap. In fact it was incredibly useful to look at the model. It helped to understand the topography of the area, importance of the river and its gorge to the east of town. Of course you couldn’t leave without making a few little purchases so every one is happy, visitor, shop-owner and tour guides who use the model to explain the layout of the town to new visitors. As I left the shop one of the city guides came hurrying after me, did you know he said, that Mel Gibson filmed his ‘Passion’ here in Matera. I had to confess that I did, now know that fact. Later we had lunch in a simple trattoria with stunning views of the town. As an Italian speaker I was helping to order food. The waiter asked me what newspaper I was from, I smiled and carried on translating dishes on the menu. He persisted, guessing that I probably worked for The Times. Later he said to me conspiratorially, ‘Did you know that Mel Gibson chose Matera to film The Passion of Christ’. I smiled and nodded. I love the enthusiasm of the Italians, their engagement with every day life. They take great pride in their work and their local heritage. They love showing visitors what they have to offer. I find it endearing and charming. It comes from the heart. Now before I finish, I’ve got to tell you something. Did you know…………..Mel Gibson made his film here? Check out: Grand Tourist my travel company website and click on Experiences. Oh, Janet–you’ve done it again! You’ve made me yearn for faraway places! Thank you for sharing your visit to Matera with us! I have never been to Jerusalem but I had a boyfriend from matera donkeys’ years ago, adn I remember the first time he took me to see the Sassi thinking it was exactly how I had always imagined Jerusalem. It’s how I WANT Jerusalem to look! One of the most memorable and remarkable places I have ever been.